I’m sure there’s a few people out there who know all about working the camera to make things look bigger, but as unbelievable as this picture might be, the 13-foot beast shown is very real indeed. Conservationists were made aware of the massive alligator after a local person saw it stuck in an irrigation ditch near Lake Blackshear in Georgia, US this week. I wouldn’t blame them for thinking they’d stumbled upon a really resilient dinosaur. Brent Howze, a wildlife biologist working for the Department of Natural Resources, went to the scene to help free the gator. It took a while to get it out of that ditch. It was bigger than we originally anticipated and we had to use heavy equipment to move it. 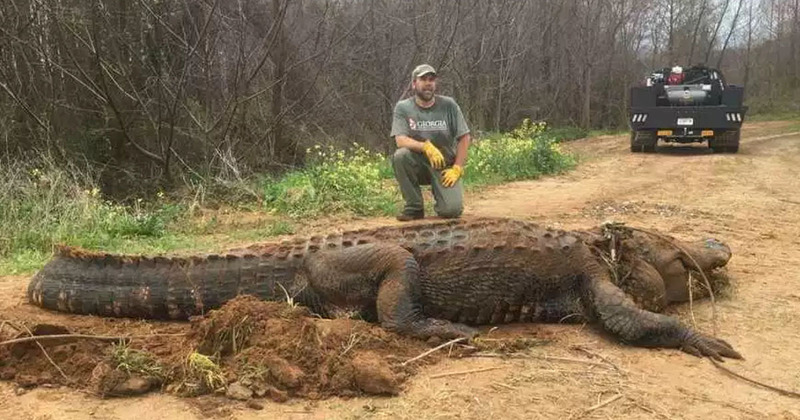 Once the alligator was out of the ditch, Howze posed for a picture with the animal – though understandably he kept his distance. He measured the reptile at 13 feet and 4 inches long, with a chest girth of 57 inches, and weighing approximately 700 pounds (50 stone). The image was shared online, but people were so shocked by the size of the beast, they refused to believe it was real. The dude is further back from the reptile making appear a lot larger than it really is. Wonder if he could be any further away from that gator, to make it look huge. Apparently a lot of people think it’s fake, but I can assure you that it is not. I’m the one in the picture, and you can probably tell that I didn’t get too close to it. Sadly, once the conservationists got a better look at the alligator they realised it was in poor health, and that the best thing to do would be to put the animal down. It was a very old alligator in poor body condition with what appeared to be gunshot wounds. It’s an unfortunate situation, but the best thing for the animal was to be put it down. He also assured locals they shouldn’t be worried about alligators when swimming or playing in the water at Lake Blackshear.